This editiorial is courtesy of Sloane Terech. If you enjoyed the article or have any comments feel free to share, leave your comments below or you could tell her so @sloanetweets on Twitter and be sure to check out more of her posts on Tumblr under TrashBagHo and on NoDQ.com under Not Another Fangirl Enjoy! It’s the question that has transcended wrestling eras, created historical controversy, and has been a driving force in internet chat rooms and with professional writers alike. It has been asked in many different contexts; implied in promos; reported across a worldwide audience. It’s something wrestling fans are discussing at any given time…Does physical size matter in wrestling? The answer, right now in 2014, is yes. Now before you get hot, let me explain that I’m in no way discrediting the talent or potential of smaller stars. I do not believe that those of smaller stature are less skilled in-ring performers or less capable of being mainstream superstars, if given the proper accommodations. But the history of professional wrestling as sports entertainment and the state of it today has showed us that larger size superstars are - let’s just say it - best for business. 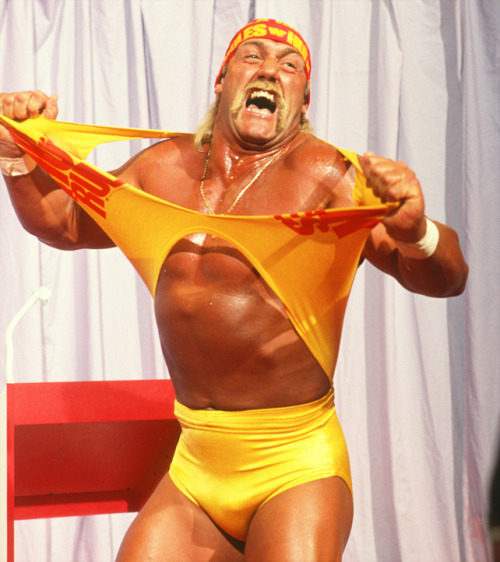 We begin in the mid-1980’s when Rock and Wrestling ruled the airwaves and Hulkamania ruled the rest of the world. It’s this era that many of today’s favorite superstars, such as John Cena and Edge, credit as being their inspiration for wanting to become superstars themselves. The reason for this, and why we all fell hook line and sinker for it, is because wrestling superstars were larger than life. They were bigger and stronger than regular people. Hogan, Muraco, Sheik, Warrior, Demolition, to name a few; all of these superstars stood taller and had larger muscles than you, so you looked at them as SUPERstars. The way in which they got those muscles is irrelevant in this context. What’s important here is that fans were simply in awe of their presence because they were so unlike anything you’d see just walking down the street. And having extra size meant the ability to exaggerate personality that much more and be HUGE in every way. This was the template for the decadent era of the 80’s, a time which is largely seen as the most successful time in wrestling. Speaking of, go ahead to the early/mid-90’s. This is a time that is widely regarded as a low point in history. Following the steroid scandal, WWE looked to focus on more natural looking stars with smaller physiques, like Bret Hart and Shawn Michaels. Even with these major stars at the top of the heap, this was not a prosperous time for wrestling. In fact, this era is often remembered for its campy, cartoonish, downright ridiculous storylines and string of one-gimmick-wonders. While these years did produce some Hall of Fame stars, this was more so a transition period in which WWE was simply trying to disprove the previous trial they’d been through. Even in the latest History of the WWE documentary, the Undertaker himself recounts these years as being very difficult. This brings us to the Attitude Era. I know what you’re thinking: the stars of the Attitude Era weren’t huge guys. Well, 1: they didn’t need to be and 2: actually a lot of them were. Maybe Austin and Jericho weren’t jacked, but the Rock and Triple H sure were. But the other point is more important. The WWE rebranded to an aggressive and physical product. The superstars did not need to be physically imposing themselves because the actions were. There were no limits as to what superstars could do; multiple chair shots to the head, powerbombing women, blood baths – the stars of this era had the freedom to let the stories provide the larger than life feel wrestling fans crave and they did not need to be huge muscular guys to do that. So in this case, it was the size of that “attitude” that led to success. So to add all this up, you’ve got three time spans in 25 years: 1. Huge bodies equal success, 2. Small bodies maybe not so much, 3. Huge personalities equal success. Now how does this add up to today? For starters, the WWE has tremendously decreased superstar creativity with their PG rating. The limitations today’s performers face is exponential. I’m not saying this is good or bad, but it’s there. So they can’t rely on over-the-top storylines or overly violent spots to grab attention. They have to rely on their physical size. This creates the template for today’s version of the Joey Styles “OH MY GOD!” moment: an incredible feat of strength. Whether its Mark Henry pulling a truck or Cena delivering an AA to three men all propped up on his shoulders at once, WWE needs these moments to fulfill the fans’ need for jaw-dropping sights. The other part of this today is that WWE sees itself as a competitor to all sports and entertainment productions, so they need athletes that can compete with the looks of others in those fields and they do that by presenting the size and impressive physiques of their superstars. WWE superstars are still not connected to mainstream advertising. Non-wrestling fans don’t know if they like Randy Orton or if they don’t. But if they see Randy Orton, their attention is grabbed because he has an impressive look. If John Cena was 5’9, 225 in the Fruity Pebbles ad, he’d appear lesser than other athletes, which would make the product appear lesser, therefore discouraging companies to use wrestling superstars. With WWE on the hunt to brand itself and draw major sponsors to grow that brand, the large size of their superstars is something they need to pull in new opportunities. This is a modern attempt to return to the glory days of the 80’s. Nothing that was ever said about Daniel Bryan not being big enough or having the right look was false. Daniel Bryan is a tremendous wrestler and enjoyable to watch on television. Davey Richards and Eddie Edwards are unbelievable in-ring performers. But in terms of today’s product and the way that wrestling is presented now, size does matter. Physical presence has played a huge role in the history of wrestling and attributed to its peak years. It makes superstars eye-catching and it gives the mainstream media something to grab on to. Who has a better chance of getting on the cover of a magazine: Seth Rollins or Roman Reigns? I think you know the answer. Check out more Sloane's Wrestling Fan Resolutions, Diva Dose of Reality, The WCW Syndrome, Please Make This DVD: Wrestling's Greatest Factions, The Death of the Heel, thoughts on The Shield's possible split, Hell In A Cell & more on her Tumblr.